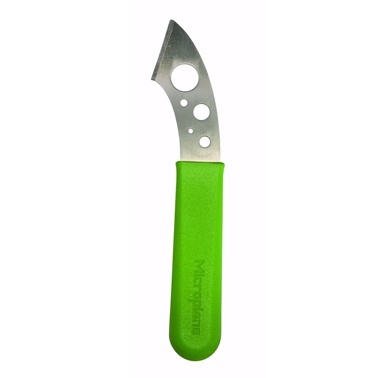 Crafted in durable stainless steel, the SwiftStrip is a uniquely curved tool that combines holes to easily strip off the leaves of herbs and leafy greens with a razor-sharp, beveled edge blade at the end for trimming stems. The SwiftStrip offers a mixture of different size holes to make it a cinch prepping all types of herbs and “superfood” leafy greens. 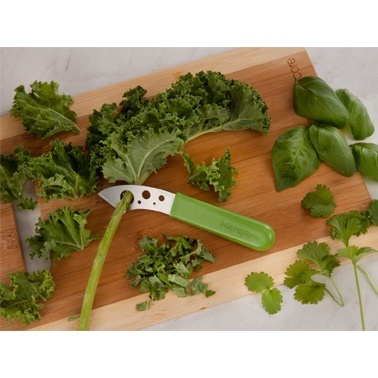 The tool’s largest hole is specifically sized to accommodate trendy and delicious Tuscan kale (also known as lacinato, dinosaur and palm tree kale). 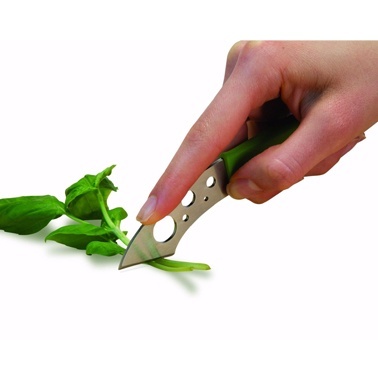 A mixture of different size holes makes it easy to use the SwiftStrip to prep a wide range of herbs and other types of leafy greens. The clever tool’s stainless steel body is sturdy enough to provide leverage when pulling stems from tough greens without having to worry about breakage.